Our zoning plan will protect the environment. We will allow more people to live in areas that are already developed, which will slow construction over wilderness and farmland. The current zoning code limits population density by restricting the number of dwellings that can be built on each lot of land. A dwelling is an apartment or house for one “family,” which is usually defined as four unrelated people. Some zones only allow one dwelling per lot. There are minimum lot sizes, which means that there is a maximum number of dwellings that can be built on each acre. For example, the R1A zone allows only one dwelling per lot, and lots must be at least 20,000 square ft. This means there can only be eight unrelated residents per acre. Since many people want to live in Ann Arbor, and the supply of housing is limited , housing is more expensive than in nearby communities. Developers respond by building houses in nearby townships. Between 2000 and 2010, Washtenaw County’s population increased by 22,021, but Ann Arbor’s population decreased by 90. 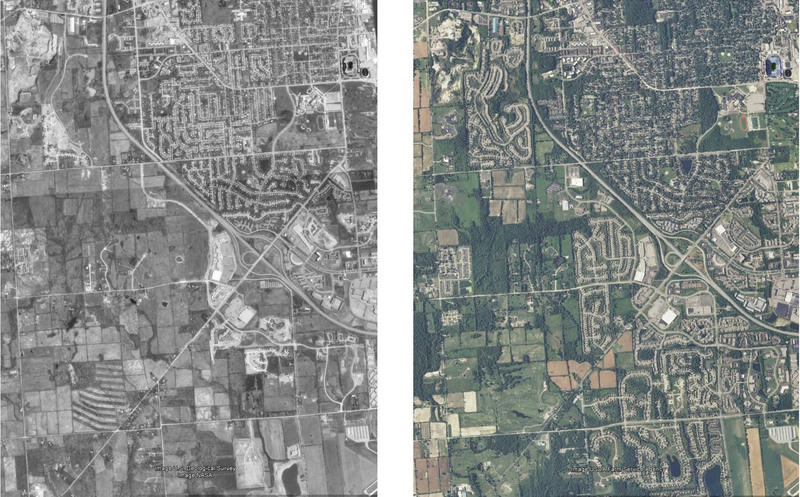 New developments southwest of Ann Arbor from 1993-2013. Maps from U.S Geological Survey. Advertisements for these developments emphasize how close the subdivisions are to Ann Arbor. A website for “The Ravines” states “Residents pay lower Scio Township taxes but benefit from city water & utilities and by sending their children to Ann Arbor Schools.” The same page later claims: “Located in popular Ann Arbor and offers great access to the expressway to get to Detroit or beyond quickly. A hop skip and a jump away is Zingerman’s Deli, Kerrytown, Kerrytown Farmers Market, U of M campus, Medical Center and University of Michigan football games. Our zoning plan will allow smaller lots, and more dwellings on each. The only limit on the number of people per dwelling will come from safety rules in the state construction codes which prevent fire hazards and other dangers. More people will be able to live in areas which are already developed, which will slow construction over wilderness and farm land. We will reduce travel distances by allowing more people to live near businesses. This will reduce air pollution from vehicles. Our zoning plan will allow a mixture of land uses in every part of the city with rules to prevent noise and other nuisances. Apartments, houses, and businesses will be permitted in the same area. This will make it easier to reach destinations on foot. It will also be easier to run busses and other forms of public transportation, because more people will be allowed to live close to transit stops. 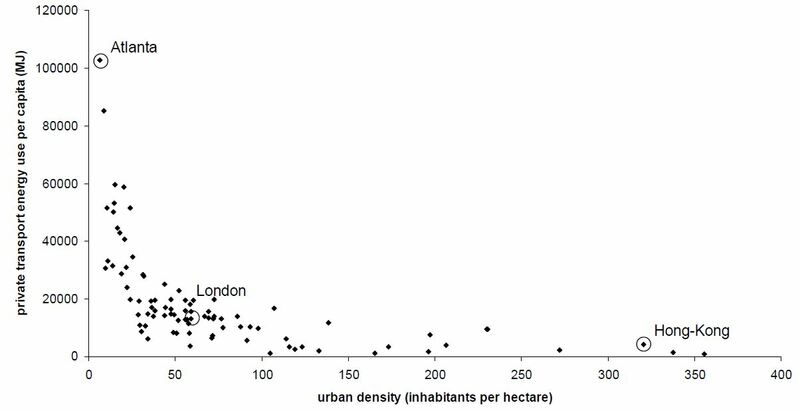 Research shows that increased population density is linked to decreased car use and more generally, decreased transport energy use. Even though our zoning plan will likely decrease car use and pollution, it may make remaining car travel more convenient. If population density increases, traffic density will increase, but destinations will be closer together. Research suggests that having destinations closer together speeds travel more than traffic density slows it. Our zoning plan will also reduce traffic congestion and air pollution by abolishing off-street parking minimums. Currently, when someone builds a new structure, they must include a minimum number of parking spaces. The number depends on the size of the structure and the type of land use. These minimums exist so that people who drive to the new structure do not take up parking spaces on the street, but there are studied negative consequences. Houses and stores are spread apart by parking lots, which makes walking and public transport difficult. Commercial and residential space is more expensive, because every new development site is partially filled by parking spaces. Traffic congestion increases, because more people drive when they can park for free. Reforming the zoning code to allow compact arrangements will slow urban sprawl, reduce vehicle use, and make all forms of transportation more convenient. Our zoning plan does this while better protecting residents from nuisances. This entry was posted in Uncategorized on August 30, 2013 by mixeduseparty. ← The current zoning code cannot protect people from harm. Our zoning plan can. The current zoning code cannot protect people from harm. Our zoning plan can. Our zoning plan will make housing more affordable.